I'm glad to know we're not the only prospective adoptive family who has changed their minds and course of the journey. At times it can feel overwhelming not to have a settled sense of where we're headed. Over the past several months, God has changed our direction. And so, we are going to take a leap of faith and start the process of adopting from Ethiopia! God shut several doors since May, and now it's pretty clear that this is the only one open to us right now. So, we're ready to step through. Will you pray that God would be glorified? Ethiopia is a beautiful country situated in Eastern Africa near the Red Sea with a population of 53 million. It is one of the oldest countries in the world and was the home of the Queen of Sheba. Seventeen years of civil war bankrupted the country and left thousands of orphaned children. The numbers continue to increase as the diseases of poverty cause premature deaths of parents. Thousands of children are living in institutions because their parents can no longer care for them. Many children are orphaned due to poverty, the residual effects of war, drought or famine, or their parents may have died of disease, including but not limited to AIDS related illnesses. The children are well cared for in orphanages or hospitals, but are in great need of a loving family environment. We are so thankful that God is sovereign and completely trustworthy. And so we continue to trust His leading. 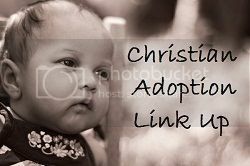 God has put adoption on our hearts. And so we did our part... researched and prayed and read some more... and decided to go for a Russian adoption. Those kids really need to be rescued. They have a bleak future. But as we started the process, God put situations in place that caused us to step back and slow down. What? Not Russia, Lord? Where, then? More research into programs and agencies... more prayer... seeking His direction and peace. We are not particular about what country we need to adopt from, but the adoption program and agency we use needs to be a good fit for our family. So now we are waiting to hear back if we qualify for the China Special Needs program. If not that, then it looks like Ethiopia. There are many needs everywhere. Different parts of the world. Millions of orphans. We can't change the world, but we can change the world for one. We have been able to check many things off our list as we wait: physicals, police clearances, Hague-compliant international adoption training, etc. This will help us to be able to move quicker when our exact adoption direction is clear. Oh, and if you're filling sippy cups for us, we will print new labels when we know what country we will be adopting from. And so, we're trusting that this path is the one God wants us on. We're believing that God will lead us to just the right little one for our family. A little girl that will be our beloved daughter and we trust that, one day, she will put her trust in Christ and become an adopted daughter of the King! *For a cup brimful of sweet water cannot spill even one drop of bitter water, however suddenly jolted. You can purchase this wonderful little book by Amy Carmichael using our amazon.com and amazon.ca links below. Each purchase you make using our amazon link will put money toward our adoption expenses.